Well. ya'll know how much I love my monthly Birchbox beauty sample subscription. So, when I came across MyGlam's version: the Glam Bag, you know I just had to give it a try! The concept with MyGlam is very similar to Birchbox. You pay $10 per month for a cosmetic bag aka "the Glam Bag" filled with 4-5 delux sized beauty samples. The MyGlam site has tutorial videos featuring products from the Glam Bag. When you sign up, you take a beauty profile quiz. But, it dosn't seem that the bags are customized from your beauty profile. Everyone gets the same bag each month. You can also upload your own videos on the MyGlam site to feature yourself using your bag. Do I really need 2 sample subscriptions? Probably not, but I have been so happy with Birchbox that I just wanted to give MyGlam a shot too! Especially after hearing some of the previous month's hyped bags with full-sized "samples". When I went to sign up a couple months ago, I got wait listed. This only increased my anticipation! Another factor influencing my decision: MyGlam was founded by some popular YouTube Beauty "Gurus" (lol, that terminology totally bugs me). So, I felt joining was "supporting the beauty community" on YouTube! You know, I have to give these girls props for making a career out of beauty! 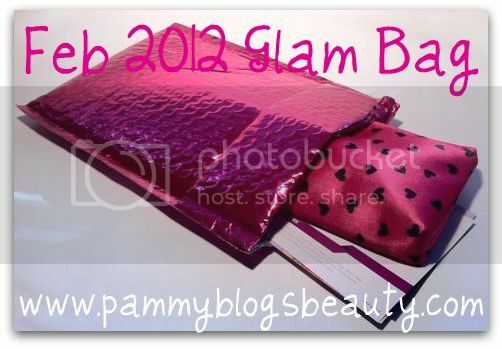 To see my February 2012 Glam Bag opening and hear my first impressions (including comparisons to Birchbox), please keep reading after the jump. Since I am new to MyGlam, I just can't help but compare it to Birchbox since most of my sample-subscription experience is through Birchbox. On a whole, I am totally pleased with Birchbox! There are certainly similarites between MyGlam and Birchbox, but also differences. For example, Birchbox tends to keep their upcoming box a "surprise" with only occasional leaks for a few items from the box. With MyGlam, the cat seemed to be out of the bag as far as what the samples were (pardon the pun! ), before my bag even arrived! So, no "surprise" element there. The biggest surprise to me? The MyGlam bags are not personalized. From what I gather from the website and some other reviews? Everyone got the same bag? I am a bit let down here. Especially since most of the products included in my GlamBag do not work with my skin type. Bummer!!! Not to mention that I prefer makeup samples over skincare samples anyway. I am just much more picky about skincare (and easier to please with makeup samples). While Birchbox is also heavy on the skincare samples, at least those samples work for my skin type. Also, the skincare brands that Birchbox samples appeal to me more. While I appreciate that this bag has a theme (lets face it, I dig things like that! ), it falls a little flat since this bag arrived after Valentines Day. Now, I don't know if the bag will always come this late in the month. Or if their shipments just got behind? I know that this company is new and experiencing some growing pains. So, I will cut them a little slack for that. From keeping up with their facebook page, I know that last month's shipments were a bit of a debacle. But, that is in the past and, at least on my end, the shipment was smooth. I got an email confirmation right before the package arrived. So, with all that said, lets get into what was actually included in my bag. I know if you are like me and read a lot of reviews, the contents of this bag are no suprise. But, I will also give you my first impressions of each item. In the Intro post card, MyGlam reminds us that Valentine's Day can be significant whether you have a special date or if you are having a fun girls' night out instead. The Glam Bag Itself: The Glam Bag is a cute pink zippered makeup bag with black hearts. From my understanding, there is a new cute bag each month. While I don't really "need" another makeup bag, this one is super cute. I love the hearts! I will totally use this for something. I always find good uses for these things. X-Out Shine Control: (.75 oz sample, I don't see a retail price for this, but a face wash is $19.95 plus s/h for the kit including the X-Out shine control mattifier): This is a mattifying shine control moisturizer. As I mentioned in the post above, I have normal-dry skin. Shine is not an issue for me. So, I will not ever use this product. I will pass it on to a friend. What a bummer!!! But, with that said, the size of this sample is great .75 fl oz. So, if you have oily skin, this is a great sample in this month's bag. Stay flawless and shine free with this oil-free moisturizer with a mattifying complex. NYX Roll-On Shimmer in Green: (full sized sample: .052 oz, retails for $4.50) I am VERY excited about this *full size* sample!!! Whoo-hoo! I am a huge NYX fan. Actually, the fact that MyGlam featured NYX samples in their bags is one of the reasons that I signed up in the first place. This is a pretty aqua green pigment powder. Can be used on eyes, face, or body (but really this color is more of an eye shadow color). NYX brand new, intensely rich, shimmering powder that can be applied to the eyes, face, and body. Premier Dead Sea "Cinderella Mask" and sample: (1 tiny .07 fl oz foil samples of the Instant Stretching and Revitalizing Mask plus another foil sample of the Concentrated Facial Serum, full size retails for $149.00): This is a *tiny* sample...possibly not even enough for a full face mask. This would be cute as an "extra" in the Glam Bag, but certainly *not* a deluxe sized sample! Plus, whew, the full sized mask is *pricey*! I honestly hope that I don't fall in love with this expensive mask! Luxury Skincare rich in life-enhancing minerals from the Dead Sea waters. NuMe Professional Styling Tools and Hair Extensions $100.00 "gift card": When word leaked of a "gift card", I got excited. $100 is a great deal towards a NuMe product. But, if you are not familiar with the brand, the styling tools are very expensive (most items retail for over $100). I personally love NuMe tools! Check out a previous review that I did of a NuMe tool: NuMe Mini Flat Iron. I would love to get a travel hair dryer soon. So, I might just look into NuMe's tools again. Hair tools that will revolutionize your everyday look. 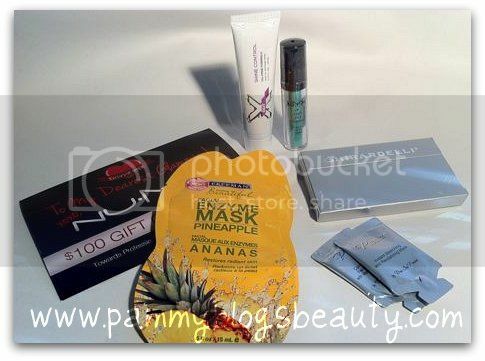 Freeman Facial Masks: Pineapple Enzyme Mask (.5 fl oz sample, full size is $10.00 for 3 large 6 oz tubes): Since this is an expensive mask, I wish that it had come in a full sized! Oh well! I love Freeman products. Actually, check out my Freeman Review! Anyways, I will certainly use this mask. Turn your date night prep-time into a soothing spa experience with easy-to-use skin-perfecting masks. Extra: Ghirardelli Chocolates: I do love the extra! What girl doesn't love Ghirardelli chocolates! Yum!!! So, that is it ladies! Those were the contents of the GlamBag. Fellow Glammies....what do you think of this month's bag? Will I continue with MyGlam? Honestly, I am a bit let down with this month's GlamBag. But, those of you who know me personally or through reading my blog know that at my very core, I am an optimist. So, while this month's bag doesn't thrill me, next month's might! But, I did like some items. I just wish that My Glam had paid more attention to my beauty survey to choose skincare that works for my skin type. I wanted this bag to be personalized. But, it seems as if everyone gets the same bag (please correct me if I am wrong?). I know that this company is new and experiencing growing pains. As those shake out, I hope the bags improve. But, at the same time, I do want to get a great value for my $10 monthly subscription. So, I won't go too long before deciding. There is a new sample subscription from Allure magazine that I got an early invite for. If I don't stick with MyGlam, I might check that out. Or just stick with Birchbox! I'm pretty sure that everyone gets the same bag. I got the same exact stuff, just a different NYX eyeshadow color. I do wish that they were personalized! I just got this too! And although it's a good deal for 10$ I'm the same as you I didnt really love the box but I am gonna give it some more time. @Savannah-I am curious to see if everyone gets the same bag next month too! @beauxsmom-Yes, its still a good deal. I am sure some bags will be better than others. Wonder what next month will bring? I subscribed after I saw how great the first (December 2011) bag was, so this was my 2nd bag. The January bag was really great and well worth $10. This bag, not so much. I think the Nume "gift card" is a cop out since it has limited use in product choice. The "Premier" is such a small sample that the pink organza bag is more useful than the sample. I did like the NYX shimmer roll-on and the chocolates were a nice touch. The shine out product I have to pass on as well as I have dry skin. The make up bag is nice, so overall it's still worth keeping at $10 a month. I don't know how long I'll stay though, we'll see how the next bag or two plays out. Hi Pammy!! I too signed up to MyGlam cuz of all the hype and well yeah this bag was eh ok...January's bag was way better. I will keep my subscription for a few more months and see if I stay or not. I cancelled Birchbox my boxes where just horrible =( but I did start getting BeautyArmy boxes which are pretty awesome. YOu should check it out! Love ya! @Priscilla-Hey girl! Too bad about your Birchboxes! I have lucked out with those. Glad to hear you like BeautyArmy!!! I looked into subscribing with them, but it seemed like more skincare type items and I wasnt very familiar with the brands they were promoting. But, I might check them out again in the future! xoxo!!! Everyone does get the same--but I like that. I HATED getting Birchbox and seeing what other people got (mine--the kind of free samples you get from sephora. 1st month not even worth $10). So I cancelled. This is my 2nd Glam bag and I like it! I'm going to let my daughter get a hair dryer (I just got a new one myself or I'd use it for me). LOVE the NYX, love the Freeman, but yes I do wish the face samples had been larger. Ate one of the chocolates today lol. I think they are going thru growing pains so I'm definitely being patient. And the cute bags are great for using to send gifts in! Tho I'm keeping this one--pink & hearts? CUUUUUTE! @Crafty Angel/Manicured Slayer-True, there does seem to be a lot of variation with Birchbox. But, generally, my boxes have been good and have valued well over $10. Glad you liked your Glam bag! I heard last month's was great and I just had my hopes up to high?? The pink bag is cute...and my chocolates are also gone (actually, eaten while I was writing the review, lol!). I am going to stick with MyGlam a few more months to see if the bags improve. Not only is this bag a disappointment in terms of the companies they partnered with (shady mall-kiosk stuff people try to peddle you? ), but I can't use a single thing except the NYX shadow bc of my skin type (dry). The NuMe thing has no real value bc that brand does it all the time, you can find coupons on the web (they inflate their prices but offer insane "discounts"); the X-Out also has no value because Guthy Renker was just clearing their inventory..
@tightsandtea-Depending on what the next bag brings...I still might cancel. Much will depend on what companies they partner with and if I can actually use the products. Just like you said, "bait and switch"...I signed up after seeing the past few months great bags!